The genus name Hyssopus derives from the Greek name for the plant, hyssopus, a term that is itself of Semitic origin and perhaps deriving from the Hebrew ezobh, meaning "holy herb," in reference to the plant's use in purifying places of worship. 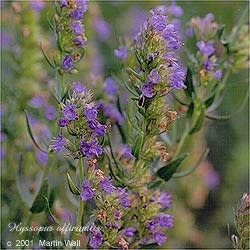 Hyssop is a highly aromatic, mostly evergreen perennial native to Eurasia. It is woody at the base, has square stems and rodlike branches, and can grow to 2 feet in height. The leaves are opposite, lanceolate to linear, and thick, with one rib underneath. The flowers are usually purplish blue but sometimes are white or pink, and they grow in whorls of six to fifteen flowers. The plant prefers full sun to partial shade, has low water requirements, and does well in sandy, welldrained soil. The flowers are much relished by bees and butterflies. Hyssop warms and stimulates the lungs, helps the body expel phlegm, increases respiratory capacity, balances circulation, and cleanses the kidneys. It is being researched for its beneficial effects in cases of HIV. It is used in the treatment of amenorrhea, anxiety, asthma, bronchitis, catarrh, chicken pox, colds, congestion, cough, debility, depression, dropsy, dyspepsia, fever, flatulence, flu, grief, hay fever, headache, herpes, hoarseness, hysteria, indigestion, jaundice, parasites, phlegm, rheumatism, scarlet fever, scrofula, shortness of breath, smallpox, sore throat, tuberculosis, and whooping cough. Topically, hyssop tea can be used as a gargle to soothe sore throat; as a compress to treat black eyes, bruises, insect bites, sprains, and wounds; and as deodorant wash. Hyssop as a bath herb or compress can be used to relieve rheumatism and muscle soreness. The young leaves and tips of the shoots are edible. Some use the fresh herb as a seasoning substitute for sage. The flowers are both edible and decorative. As a tea, hyssop is light and aromatic. Hyssop was once used as a strewing herb and to deter bugs and the spread of infection. The essential oil is used in perfumery. Avoid during pregnancy and in cases of epilepsy or high blood pressure.